Many sailors eventually make the transition from sailboats to trawlers. While they take a lot of ribbing from their sailing buddies, the move can be a logical one-less work, more space and a warm inside steering station. The Northeast 400 from Cabo Rico may just make sailors think twice about becoming power converts. Cabo Rico has produced a motorsailer that actually motors and sails very well. That sailing performance is a result of designer Mark Ellis' deft hand, who is well-known for his Nonsuch catboats and Niagara cruisers. Cabo Rico has been building boats in Costa Rica for almost 40 years. While this may conjure images of leaky sheds in an unstable banana republic, the opposite is very much true. Cabo Rico runs a professional production facility with a dedicated work force-its average worker has been with the company for more than 17 years. Its Central American location affords easy access to teak, and one look at Cabo Rico's boats proves it is very proficient in its application. A stable skilled workforce, an ideal climate, rich local raw materials and easy access to U.S.-sourced supplies puts Cabo Rico, and its customers, in a great position. One of the unique aspects of Cabo Rico yachts is its very complete owner's manuals. The manuals contain full mechanical drawings of all of the systems on the boat, complete with color photos showing all stages of constructions and full details on the systems. To make this information even more accessible for today's high-tech boat owner, the entire manual is also provided on DVD. This complete reference will make the boat easy to maintain throughout its life. I recently joined Jeff Wingfield and Lee Maugens aboard their new Northeast 400 Moon River on the Chesapeake Bay. Jeff has a long history in sailing and owned a Grand Banks trawler for many years. Lee is a dyed-in-the-wool sailor since childhood, and her father built sailboats for a time. When they went looking for a liveaboard boat the Northeast 400 proved to be a perfect fit. The two of them have been happily living aboard and plan to winter in the Bahamas. The Northeast's hull is robustly built. The hull is cored for sound and temperature insulation and to control weight. There is an option of Core-Cell or balsa coring. To keep the hull strong, it is laid up with a very thick outer skin. The deck is cored with balsa, but is solid glass in high-load areas and around any through-deck penetrations. The hull has a 10-year warranty and is constructed with blister resistant vinylester resin. The hull and deck are married in a U-channel joint covered by a beautiful solid teak caprail. The hull has an inward-facing flange and the deck wraps over this flange forming a raised bulwark. The joint is bonded with 3M 5200 and through-bolted with stainless steel fasteners and fastened with aircraft-style locking nuts. This joint results in a very stiff structure, eliminating any flex underway. The bilge contains a rugged fiberglass grid system with no integral wood, eliminating any chance of future rot. There is a solid fiberglass subfloor on top of this grid, and it is covered by a beautiful teak strip floor. The ballast is a Mars Metals lead keel securely bolted into the massive grid system. Cabo Rico continues to use true structural bulkheads fiberglassed directly to the hull, further strengthening and stiffening the hull. Engine and system access is great. The main access is through a large panel in the saloon floor. The engine space is nicely set up with twin selectable Racor filters, a beefy strainer, ample electrical systems and bright lighting. The deck on the Northeast is a joy. Raised bulwarks and secure lifelines makes for a very secure foredeck. The wide sidedecks and ample handholds along the pilothouse make for a safe trip between the cockpit and foredeck. I was very comfortable in the wide, deep cockpit. The seatbacks provided great back support and the overall depth gave a very secure feeling. There is a large table with internal storage in the center of the cockpit. The cockpit lockers are cavernous, more than large enough for full cruising gear and even bicycles. Jeff and Lee, avid scuba divers, used a portion of one locker for scuba tank storage. Having spent my fair share of time stuck in the enclosed pilothouse of a trawler, I was very happy to see a proper helm station in the cockpit. A pilothouse is great on a cold or wet day, but in nice weather there is no place better than the cockpit. Visibility from the cockpit is sometimes a challenge on pilothouse sailboats. Classical thinking raises the cockpit and lowers the house so you can see over the top, but Cabo Rico instead surrounded the pilothouse in glass and the view right through is great. 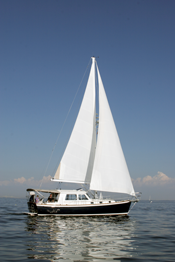 Not found in most sailboats, the boat offers a transom boarding door and full swim platform. This is great when diving or swimming off the boat, and equally as useful at the low docks. Moon River had a furling 140-percent main genoa and an optional furling main. The furling main has been a popular option, in tune with the easy-living aspects of this boat. All lines are cleanly led aft to the cockpit coamings. Overall, the deck hardware is robust and nicely installed. Down below is a misnomer on this boat, the entire interior is bright, airy and up on the same level as the cockpit. Stepping through the sliding door from the cockpit to the saloon you find yourself in a bright, wide open space. Jeff and Lee customized this space to be even more open than usual by deleting the dining table and one settee. Their plans were to use movable chairs and tables, and Cabo Rico obliged by custom designing solid teak tables that can serve as dining or cocktail tables-it even completed the package by building a custom storage rack in one of the lockers. Speaking of custom, all of Cabo Rico's boats are built on a semicustom basis, so there are plenty of ways to make the boat truly yours. At the forward end of the saloon is the inside steering station, a very comfortable place to be when the weather turns cold and wet. The visibility from this helm is very good. Jeff and Lee opted to have their interior finished in classic northeast style, with bright white laminate surfaces and fine varnished teak trim. Forward of the saloon on port, and a step down, is the galley. The galley offers a large top-loading refrigerator and freezer, with ample counter space all around. A gimbaled Force 10 stove and deep sinks round out the galley. The cabinetry provides plenty of storage and space for a microwave oven. Cabo Rico's custom touches were again evident in the galley. Lee has an affinity for Whole Foods spices and herbs, and Cabo Rico custom fabricated a spice rack to perfectly hold the small glass bottles. Corian countertops added a nice touch. To starboard of the galley, the Northeast has a flexible space. This can be built as a second cabin, a working office, or a den. Jeff and Lee opted for a den. Custom cabinets nicely house a computer, books and entertainment equipment. Cabo Rico often adds a propane or diesel fireplace in this area, too. I'd love to spend a cold night curled up in this den with a good book and a fine glass of wine. Just forward of the galley is the head. Jeff and Lee opted to divide off a portion of the head into a dedicated shower stall, though a conventional full head space with integral shower is available. I would opt for the shower stall, it makes the rest of the head a little tighter, but it keeps the head compartment cleaner and drier. The forward portion of the boat holds the master stateroom. The stateroom has an island queen bed and plenty of storage. The entire bed lifts up on gas struts to expose another huge storage space. When questioned about such a large boat only sleeping two, Jeff smiled and said this was by design. Jeff and Lee like their space, family and friends are welcome aboard by day, but even a commodious 40-foot boat can become a small space with too many people aboard. The light fluky conditions of the Chesapeake Bay plagued us once again, though we were able to get the boat moving 2 to 3 knots in not much more wind. Jeff assured me that he has seen great sailing performance up and down the East Coast, and any wind over 10 knots nicely drives the boat. The Northeast has a very stiff hull form and is able to carry a lot of sail. Fraser Smith, president of Cabo Rico Yachts, relates a story of sailing a Northeast in 25 knots with full sails up and moving along at almost 9 knots to weather. The light conditions allowed us to try out the motor side of this motorsailer. The boat has a 100-horsepower Yanmar diesel, which pushes the easily driven hull to 10 knots, though economical cruising speed is a bit slower. The boat has a fixed three-bladed prop, so there is plenty of power in reverse, though a feathering prop would offer a bit less resistance when sailing. Cabo Rico offers an optional bow thruster, but Jeff has been very happy with the handling of just the single screw. Though we did not get a chance to fully test the boat's wind-powered performance, the ample sailing rig of the Northeast will drive the boat nicely when there is enough wind and will stabilize the boat when conditions warrant motorsailing. The Northeast 400 is a unique boat equally at home beating to weather in the Bahamas or steaming along under power in a windless Maine fog bank. These characteristics make the Northeast 400 a compelling choice.